Adam’s love affair for the new TBS Series Final Space continues unabated with the third episode of the Sci-Fi animated series. Many a series has made a splashy debut with their very expensive pilots but it’s rare to see the quality of said series to hold up over the course of the season and eventually an entire long-running series. With one episode (it does help this reviewer has seen the first six episodes) Final Space shows no signs of the dreaded quality dip going to series. If anything the Third Episode of Final Space indicates that the series will only get better from here (it does). After the events of the Pilot, Gary and Avocato (the feline badass bounty hunter Gary met in the pilot), begin to search for Avocato’s son Lil Cato. But before that search can begin they must find a safe planet or system to harbor Mooncake aka the ultimate space weapon/face hugger. Avocato knows what Gary has just learned; The Lord Commander will stop at nothing to get Mooncake. Time travel, wormholes, cookies, and a huge arena battle to the death all play a part in this episode. This sets the stage for an actual consequences laden episode. The thrill of watching this series is Orlan Rogers and the other Series Writers challenge to make every episode “matter”. The series finds its footing almost instantly Post-Pilot. There are a confidence and bravado on display in the storytelling and direction. Not only stylistically but also emotionally, the show isn’t afraid to make you care about these characters. The show is requisitely epic in its locales and action but in service of what? If there is no emotional core then it’s all for naught. That is where Final Space finds it excels. Every character has an emotional life. Beyond Gary and Avocato, Quin, Mooncake, KVN, HUE, and even the Lord Commander all have specific emotional lives beyond the primary story we begin to get glimpses of. That care and attention towards the character are what separates truly great Sci-Fi from the pack. Much of Science Fiction (especially in Movies and Television) is thematic-based and plot-based. 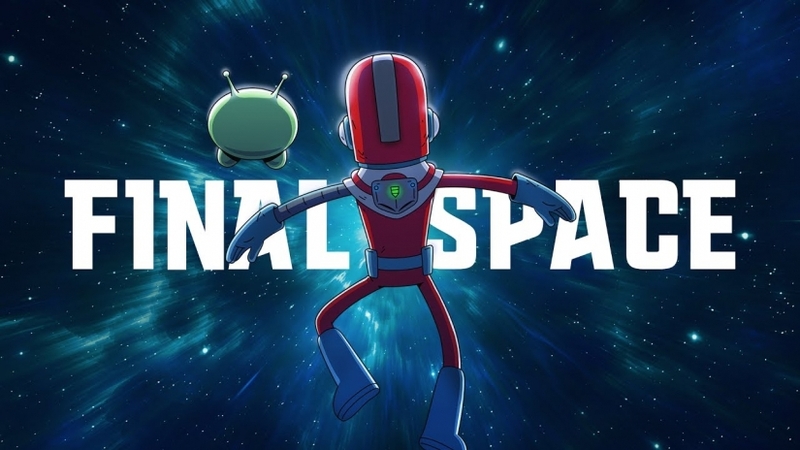 Final Space is that rare venture that merges both the logical and emotional together. Their secret weapon is having found that alchemy of humor, pathos, and seriousness that works so gracefully, they make it look all too easy. It’s effortlessly heartfelt storytelling that is equal parts hilarious and sarcastic. Final Space is confident science fiction adventure comedy at its best.